Longtime makeup brush and accessory company Japonesque recently delved into the world of color cosmetics, and we got the chance to try a few of their new products! The new collection features two different face primers: the Velvet Touch Primer and the Radiance Primer. Here’s what we thought of them. As you might expect, the Velvet Touch primer leaves your skin with a velvety finish. It’s mattifies your skin just enough so that you don’t have too much shine, but you still have a soft glow. If you have even slightly oily skin, it’s great for keeping your makeup in place and preventing you from becoming a shiny mess. 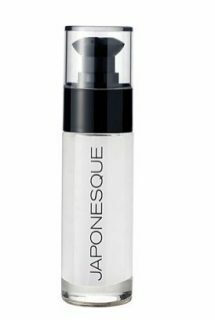 The Radiance primer is not recommended for ladies with oily skin, but those with dry skin might like this to add some shine and glow to their look. However, we found the pearl finish a bit too sparkly for everyday use. The best way to work it into your beauty routine? Try using it as a highlighter rather than a primer. Put a thin layer on your cheekbones, bridge of your nose, cupid’s bow, and brow bones for a bit of that Kim Kardashian glow.